Para the book, veja Touching the Sky (book). 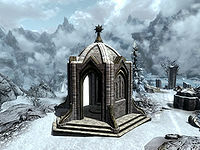 The first wayshrine, the Wayshrine of Illumination, is through the portal Gelebor opens that leads you to Darkfall Passage. You will find it at the end of a long, dark trek through Darkfall Passage, where you will encounter several leveled Falmer and chaurus. Be sure to destroy any chaurus cocoons you come across before they have a chance to hatch. To get to the wayshrine, just follow the winding path, illuminated by tube worms (which look like odd pink flowers) that disappear as you walk past. The second wayshrine, the Wayshrine of Sight, can be found soon after emerging from Darkfall Passage into the Forgotten Vale. It is to the north of the path that climbs up out of the entry vale through the arches. 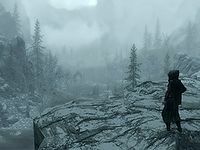 The third, the Wayshrine of Learning, will be found after continuing up the path, passing through a narrow pass inhabited by frostbite spiders, then dropping down to a narrow river valley. The wayshrine is located just downstream from where the path reaches the river bank. After crossing the river below the third wayshrine, zig zag southwest and northwest up the steep path to a large, frozen lake. Beware the two dragons, Naaslaarum and Voslaarum, that will attack you as you cross the frozen lake (if you have killed the dragon in Dragon Rising). The fourth wayshrine, the Wayshrine of Resolution, is above the northwest bank of the lake. Don't forget to pick up a Shout from the large rock jutting out from the middle of the lake on the eastern side of the lake. The fifth and final wayshrine, the Wayshrine of Radiance, can only be reached after a long, arduous trek through Forgotten Vale and Glacial Crevice. Before entering the Glacial Crevice, take a right down the last bone bridge. Keep going and you will come to a small Falmer hut which houses Unknown Book, Vol. III, "FAIRE AGARWEN LIFE RECORD" (See Forgotten Vale Books Quest). Go back and enter the entrance to Glacial Crevice. The initial path through Forgotten Vale takes you through a series of Falmer dwellings nestled in among the cliffs above the river, and connected by a series of rope bridges and stone ramps. 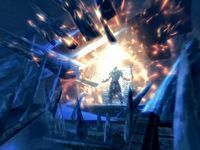 Fight your way through the leveled Falmer that call this area home, then enter Glacial Crevice. This area consists of a series of glacial chambers with icy ledges and rope bridges that ascend among a scattering of Falmer tents. Dispose of the many leveled Falmer that occupy this zone until you once again emerge out to Forgotten Vale. This final part of the Vale consists of a confusing maze of Falmer tents and platforms crowded within a series of narrow, twisting canyons. Pick up the Unknown Book Vol. IV from a hut in the second village, before the wayshrine. The ascent to the Wayshrine of Radiance is a tunnel found on the canyon floor at the very end of the Falmer village. You may use Auriel's Bow to blot out the sun. It will not be permanent; it will only last until 7pm (which is sunset; you can shoot out the sun again the next day, as the sun will rise at 5am). If you lost your second follower on entering Ancestor's Glade, you will have an opportunity at the end of this quest to regain that slot. 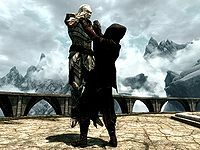 Right after you kill the boss, Serana will stop following you around again (as during the end of Chasing Echoes) and you can fast travel away to grab a second follower. There isn't a direct return point, but you can fast travel back to Forgotten Vale and use the portals, then run quickly back through the castle and finish the quest by speaking with the NPC waiting for you and taking Auriel's Bow. This time, your second follower slot should be permanent - though you should make sure to have two followers for 'Kindred Judgement' and any plot quests that are instanced. And never dismiss Serana or you will lose the second slot. If you have not killed Naaslarum and Voslaarum it is possible for one of them to fly to the balcony and interfere in the fight with Vyrthur. They can even kill him for you. If coc is useless, and your queststage is 110, use the sapphire paragon. You must use console command tcl, and then you can gain entry to the Inner Sunctum (remember to use tcl again after gaining entry). Then, leave from the Inner Sunctum via the door, and Serana will be with you again. Esta página foi modificada pela última vez à(s) 14h17min de 2 de abril de 2016.